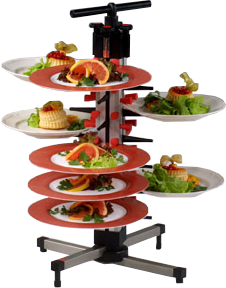 The Plate-Mate Plate Stacking & Serving System saves space, labor, time and money. If you have a space problem in your kitchen, we have the solution. Ideal for use as a catering plate stand and catering plate carrier. Use our site to find the plate rack that is perfect for your needs. 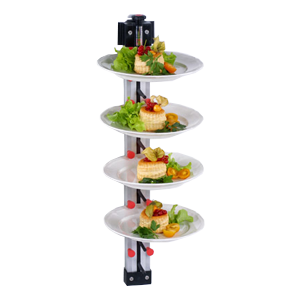 Plate-Mate plate stacking system can make multiple plate handling a cinch whether it is in your commercial kitchen, used as banquet equipment, a catering event, or even a ship’s galley. 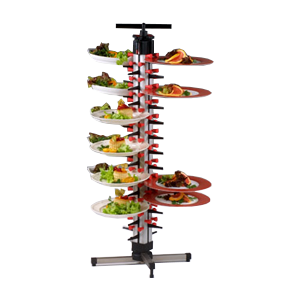 Plate-Mate speeds service and saves labor costs with it’s dinner plate trees. 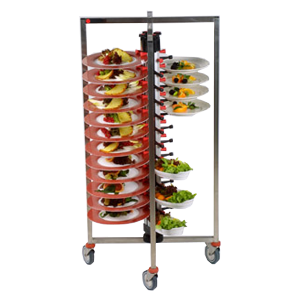 All Plate-Mate plate racks and trolleys are designed with adjustable arms that allow for plates, dishes, or trays of varying shapes and sizes to be quickly, simply, and securely stored as well as removed with the greatest of ease. 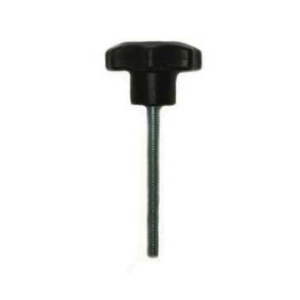 They are widely used in commercial kitchens: restaurants, cafeterias, resorts, casinos, hospitals, nursing homes, cruise ships, hotels, and more. 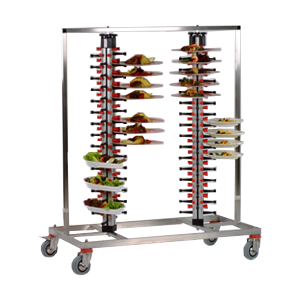 The Plate-Mate Stacking & Serving Plate Holder System has been especially designed and engineered to permit food to be prepared and plated in advance without taking up valuable counter space; thereby quickly freeing prep room for more catered course plating. 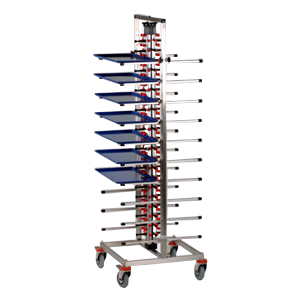 Plate-Mate plate stacking system is sturdy and needs practically no maintenance. 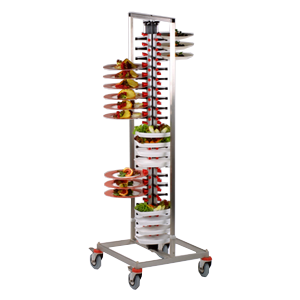 Plate-Mate catering plate racks are high quality commercial plate holders that are useful in any catering and commercial kitchen. Our Jack Stack – like plate holder can be used by many. Whether you are a chef trying to serve food hot to a large group or a caterer with 3 different courses to plate all at once, the Plate-Mate is the useful and industrial quality server you need.